Many young soldiers, aged 18- 30 yrs, are admitted with renal failure in various Armed Forces Hospitals and are faced with the bleak prospect of a life time on dialysis. As a result the organization loses the services of a highly trained soldier permanently. This scenario is however very different once they receive a kidney transplant as the individuals are able to return to active service within a short period of time. The Department of Nephrology & Renal Transplantation of AH (R&R) Delhi Cantt is the apex transplant center of the Armed Forces Medical Services that has carried out over a 1000 kidney transplants over the last few years. In addition to the serving soldiers themselves, the family member of our soldiers also receive the benefits of renal transplant enabling them to continue to lead a healthy and active life. Our patients continue to benefit from the services of Army Hospital (R&R) even after retirement as transplant of our veterans and their families are also regularly carried out. The highly professional and dedicated team of Army Hospital (R&R) has significantly increased this number by carrying out almost 80 renal transplants in the year 2015, the highest since inception of the program. The Dept of Nephrology, Army Hospital (R&R) also has an extremely successful cadaver transplant program with a total of 80 cadaveric transplants having taken place over the last few years. The center has had the distinction of already having carried out 14 cadaveric transplants within a span of just six months in 2015 thus giving a fresh lease of life to patients without living donors. The organ sharing and retrieval organization of the Armed Forces (AORTA) ensures that organs are retrieved and rapidly transported to AHRR in time for implant into needy patients. Such cadaveric kidneys are harvested after due motivation of the relatives of brain dead patients in the Intensive Care Unit of AHRR. 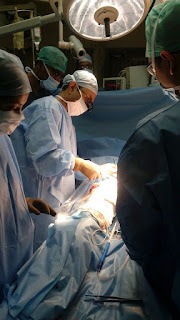 Uniquely, such organs are received not only from within Army Hospital (R&R) but also from other hospitals within Delhi NCR. Organs are harvested and transported by air even from distant cities such as Chandigarh, Lucknow and Pune to AHRR for transplantation. The administrative setup of the Armed Forces provides the necessary administrative and logistic support to make this endeavor a resounding success. Earlier, live related, unrelated and cadaveric transplants were limited to blood group compatible donor as is the case with blood transfusions. Deliberately or inadvertently crossing the blood group barrier resulted in near complete failure of the transplant. Over the last two years the Dept of Nephrology at Army Hospital (R&R) has established the protocol for ABO incompatible transplant in this hospital and successfully carried out 14 such transplants across the blood group barrier. All these patients now lead an active normal life. This landmark achievement ensures that AHRR is at the cutting edge of technology and makes the same available to its patients.